Regular cleaning and maintenance will save you money on your electric bill and on costly early replacement by extending the life of your HVAC unit or heat pump. An AC unit requires regular attention and servicing to be sure that it is operating as efficiently as possible and a clean AC unit uses approximately 30% less power than a dirty one. In addition to the financial incentive to keeping your unit running clean and efficiently, there is also a health incentive. An efficient AC unit prevents harmful pollutants from microbial contamination from being circulated throughout your house. Your heating, ventilating, and air conditioning system (HVAC) consists of either a furnace and AC or a heat pump; a heat pump both heats and cools. Either way, your system will have both an exterior unit – condenser coil and compressor – and an interior unit – evaporator and blower motor. 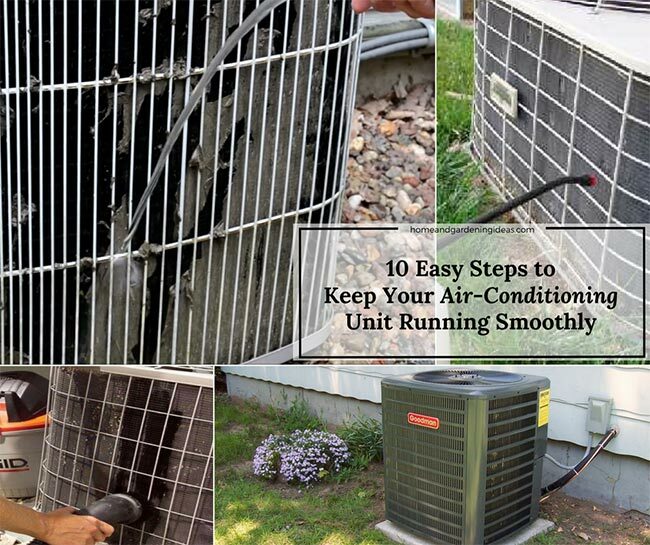 Below, you’ll find step-by-step instructions for keeping your air conditioning unit running smoothly. These instructions apply to a heat pump unit or a home air conditioning unit. The best part is knowing that you don’t have to dip into your kids’ college funds to hire a professional when you can just do the job yourself by following these simple steps. And now is the time to do it, just before the new cooling season begins. Turn off the power at the breaker box and also on the exterior condenser/compresser. It would be extremely dangerous to work around a live current and the air conditioner’s many moving parts. On the exterior condenser/compreser, use a screwdriver or wrench to remove the screws or other hardware attaching the fan cage or grill to the unit. Clean dust, leaves, grass clippings, and other debris from the interior of the condenser/compressor either using your hand or a wet/dry vacuum. HVAC units are often located near dryer vents, so they can accumulate a fair amount of dryer lint as well. You don’t need anything but a garden hose and your thumb. Never use chemicals or pressure washers which are too strong and can damage the delicate fins on the unit. Simply spray the fins from the inside out to remove any built up debris or dirt. The whole process takes maybe ten minutes. Doing this annually in spring or early summer could save you hundreds of dollars. In extreme cases of neglect, if the fins are particlarly dirty, you can use a commercially available cleaning spray. These sprays can be found at home improvement stores. The unit will kick on once the power is on again and dry itself off. Carefully straighten fins that are bent out of shape. You can purchase a commercially available fin-straightening tool or just use a butter knife or similar thin tool. This requires finesse as you do not want to damage the tubing embedded in the fins. Bent fins restrict air flow and therfore retuce the efficiency of the unit. Once your unit has been hosed and the fins combed, replace the fan’s grill and clean the area surrounding the unit to reduce future debris. Clip back any encroaching branches and vegetation and rake back leaves as needed. There should be roughly 2 feet of clear space in all directions surrounding the unit to maximize efficient airflow. In cold months when the AC condenser is idle, consider covering the top of the unit to prevent leaves, branches, and other debris from falling in. You can use plastic or a piece of plywood, just be careful not to completely cover the sides. Simply remove the cover in the spring or whenever you turn on your air conditioning. Which Chicken Breed is Right for Your Homestead?